Last updated by Frankye at April 17, 2019 . Today we bring you a true story about a call that our CEO, Miles Young, recently had with one of our valued school customers. If you’ve ever struggled to redeem order reward points or wondered why product prices vary from one company to the next, perhaps you can relate! I recently received a call from a school administrator who had a corporate account with Office Depot and regularly used its website to order school supplies. She was just moments away from clicking the “checkout” button on Office Depot’s website, but an issue with redeeming the school’s reward points stopped her. You see, one of the reasons that customers keep coming back to retailers like Office Depot is that it feels rewarding to accumulate points that can be redeemed for free gifts, or “chachkies.” However, those chachkies aren’t always something that you really want or need, and the process of actually getting them can take up more time and energy than they’re actually worth. But I digress. Back to my phone call with the school administrator! The reason that she called OnTimeSupplies in the first place was because she was looking for a product that she couldn’t find on Office Depot’s website and stumbled onto our site in her search. You can imagine her surprise when she discovered that many of the items on her shopping list were priced significantly lower on OnTimeSupplies when compared to the Office Depot prices. Naturally, she was interested in learning more about our pricing model and how we can offer such competitive rates. This means that you don’t have to waste your time keeping track of reward points or coupons just to get a good deal or collect a chachkie to collect dust in your office. We offer our very best pricing right off the bat to our customers because we value your time and understand what it means to work within a budget. I also explained to the administrator how OnTimeSupplies utilizes over 35 locations nationwide to keep shipping prices down, how our dedicated employees work remotely to reduce overhead costs, and how our innovative software helps us manage our business with maximum efficiency. All of these components of our unique business model help us afford to offer top-notch customer service with rock-bottom prices. Not only that, but we deliver in 24-48 business hours, offer over 40,000 products, and have live U.S.-based customer support. We’re here when you need us, but we aren’t going to waste your time by calling to solicit additional business either. Our service speaks for itself, and our customers choose to work with us because of the awesome buying experience we provide. After sharing a bit about how OnTimeSupplies works, the school administrator emailed me her shopping list, and I turned around an apples-to-apples quote in about 10 minutes. 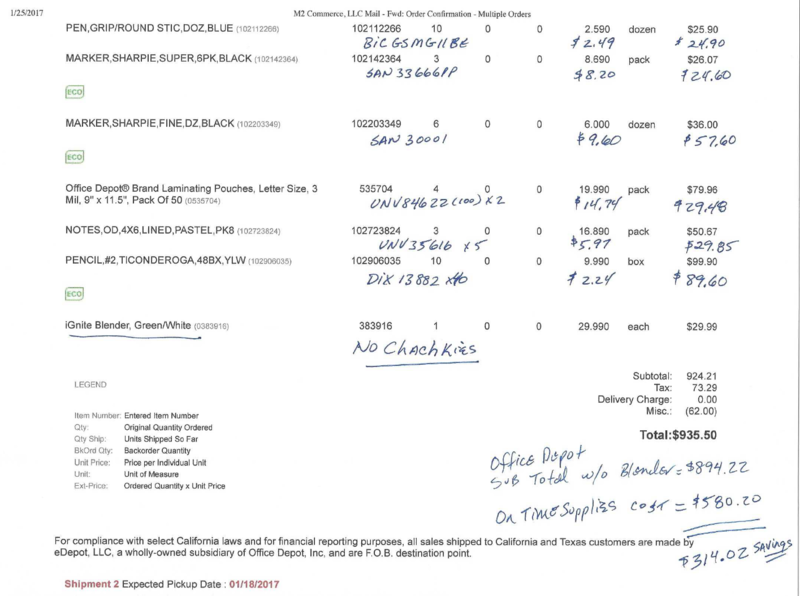 I couldn’t have been more happy to help this customer save at least $314.02 on a single order. I’ve uploaded a sample page of the comparison sheet here so you can see for yourself! Needless to say, the administrator was thrilled to save this much money, and the savings allowed her to buy a lot more for her school than a $29 blender she didn’t need. I hope that this true story provides you with a real-world example of the value that OnTimeSupplies can provide to your school or business – every order, every day. If you’re curious to see how our pricing compares to your current retailer’s on the items you buy the most, send us your shopping list for a free apples-to-apples quote today! So, What Exactly Does “Ergonomic” Mean Anyway? Ergonomic is a huge buzzword in office supplies, and with the word being used to sell every thing from office chairs to correction tapes, it can be a little hard to take the concept seriously. 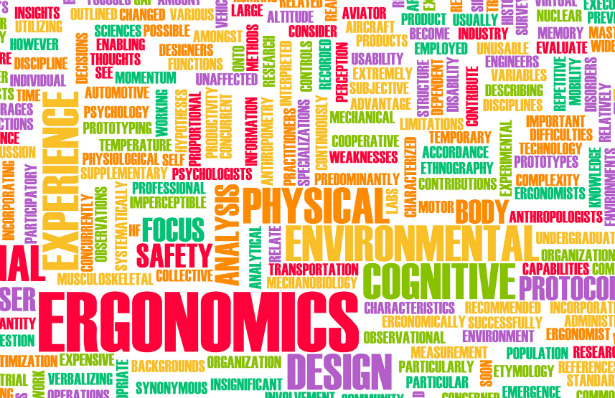 Ergonomics is not [just] a marketing ploy, it’s a science — one that’s been around since the 1800s and concerned with designing work spaces and tools to be safe, comfortable and easy to use. Ergonomic designs prevent repetitive use injuries, that buggaboo to office workers every where. While ergonomically designed office supplies such as corrections tapes are great, but unless you wield them all day, you should focus on ergonomically designed office furniture and workstations to improve your comfort and safety in the office. As one who once ended many a work days with lower back pain, I recommend that you first invest in a good office or task chair. You need a chair that provides lumbar support, and holds you back and knees at a 90° angle to the seat. Your feet should sit flat on the floor. If you’re on the short side, use a footrest. Desk stands can help your complete the ergonomic design of your workstation. For example, our arms should be at a 90° angle and your wrists straight when you use your keyboard. You can use a keyboard stand and wrist wrests if your keyboard sits too low. Moniter stands, telephone stands and laptop stands can all make your work area more comfortable. Once you’ve made these changes to your office, you’ll really notice a difference! You should experience fewer headaches and less muscle and joint pain. Check out these sweet before-and-after pics of a classy home-office makeover from the “Under my Roof” blog over at AZ Central. Erica started with a tiny alcove in the bedroom, and with a little creative shelving and storage solutions, turned it into a functional home office. Budding entrepreneurs used to turn to WH Smith for pens and pencils – now they can pick up a whole ‘office-in-a-box’. Just £10 will buy them office space for half a day, with internet access and coffee thrown in. The voucher scheme also offers a number of costlier options which include a personal assistant and meeting rooms. At roughly $16 US at the time of this writing, I feel like this is a scheme that could easily catch on in the US. Even working from home, I have found times when it would be beneficial to have an office space just for working, without the home-based distractions I can see every time I look over my shoulder. This could also be the jump-start many people need to test out new office-based ideas before jumping in whole-hog and renting out space. Overall, a really neat innovation that I hope catches on stateside. Secret to Cheap School Supplies: wait. Over at user-generated content site The Examiner, they have posited an interesting conundrum: what happens when you buy TOO MANY school supplies? The theory goes like this: you have a general list of things you think your child may need, and you buy enough of them for everyone before the first day of class. Picture yourself running out buying four notebooks here, five folders there, not to mention the six 2” ring binders that you had to get because you couldn’t resist the sale sign. All, only to find that after the first day of school, Mrs. Douglass only allows 1” ring binders. Mr. Pryor requires a 3” ring binder for science class and science labs. Now, Mrs. Rogers is simple. She only wants loose-leaf paper in a 3 Prong, 2 Pocket, $0.49 folder. What a waste. Sure, it makes sense to buy pens, notebooks, and other simple items ahead of time. But don’t get caught up in all the back-to-school craziness, sending your kid off to their first day weighed down with a hundred and one awesome supplies that will end up going to waste while you scramble to buy the “right” ones. Instead, try this: kit your kid out with a simple loadout: notebook, pens, pencils, simple folders. This will give them the ability to store any materials they are given, while writing down what supplies they still need. 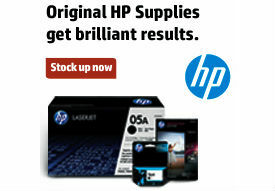 Then, find a reliable web distributor of office supplies who just so happens to offer next-day shipping, and boom. Your shopping is done, you have exactly what you need, no fuss, no muss. According to “Malled!”, a blog focusing on South Florida retail, there are some depressing numbers out there about this year’s back-to-school shopping season. Today, a survey came out from America’s Research Group that mirrors that gloomy retail prediction. It found that 34.4 percent of parents plan to spend less this year compared to last because they have “less money” (41.8%), “higher debt” (40.5%) and fear losing their jobs (8.2%). “Back-to-school spending will be a minor blip on the radar screen for retailers this year,” consumer trend expert C. Britt Beemer, CEO and Founder of ARG, said in a statement. He predicted that back-to-school spending will drop 8.5 to 12 percent compared to a year ago, when back-to-school sales declined more than 5 percent. The worst part about the economy still being in trouble around this time is that a lot of big-box retailers are going to try to use back-to-school shopping as a way to gouge innocent consumers. Since retailers know your kids need supplies, they’re going to do everything they can to increase their profits on those supplies and make back some of their long-last cash from earlier in the recession. So what can we do? The same thing I always suggest: get your supplies cheap and fast from a reputable, reliable online dealer. Skip the big-box ballyhoo and order supplies from someone you trust, at low prices that don’t rise to fit the whims of the market. It’s just good sense.